BOOK OF HOURS -Miniature from a book of hours. BOOK OF HOURS - Miniature from a book of hours. Title : Miniature from a book of hours.. Date : Paris early 1500. Size : 4.5 x 3.1 inches. / 11.5 x 8.0 cm. Description :Painted on vellum in gold and colours. From a printed book of hours. The painting shows the visitation of Mary to her cousin Elisabeth, set in a simple landscape.The miniature prefaces the hours of the "Laudes". The scene is surrounded by renaissance borders of pillars and golden penwork, and measures 50 x 60mm. The nine printed lines of text are surrounded by painted golden lines and starts with a capital "D"(eus)in gold and colours. VERSO: 23 lines of text and are preceded by coloured initials in red or blue. Condition : This little leaf is in excellent condition, the painting is done in very vivid colours. 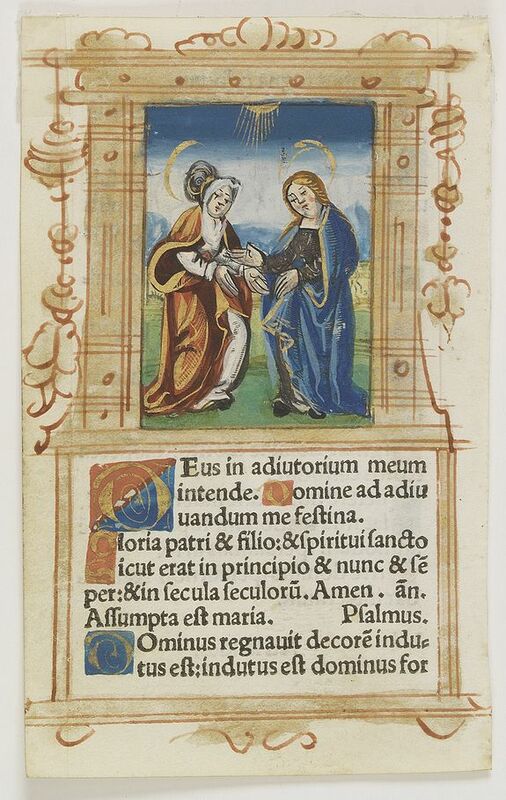 A bright miniature from the early period of printed books of hours.